The front room is supposed to be the living room but it's pretty small so we made the dining room the lounge and instead use this front room as the entrance hall-slash-Rich's office. 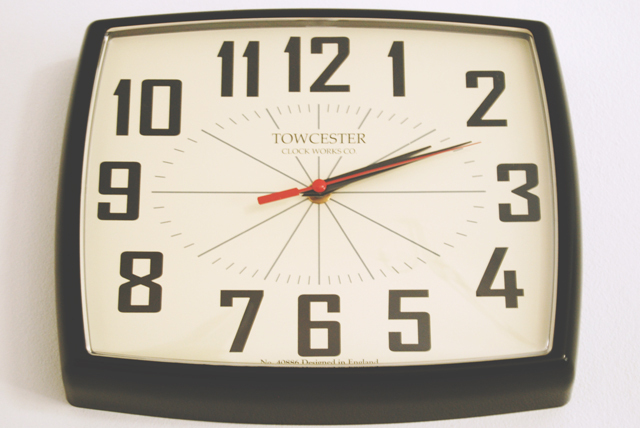 We've got an original 1960s black leather sofa in here, and I tried to go for a kind of Mad Men office theme, so I thought this clock (from Wilkinson's, no less!) was perfect. Rich doesn't like it because it ticks and he hates ticking clocks but I managed to get it up on the wall anyway! 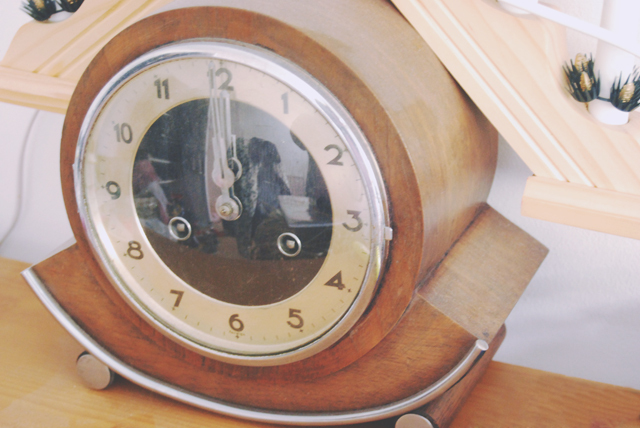 Now this clock is a real 1930s one (I like vintage clocks, ok?). It doesn't work, but I only paid £5 for it so who cares? It's pretty! Yes, that is a Christmas candle arch on top. No, I don't know why. I think the noticeboard is one of my favourite things. 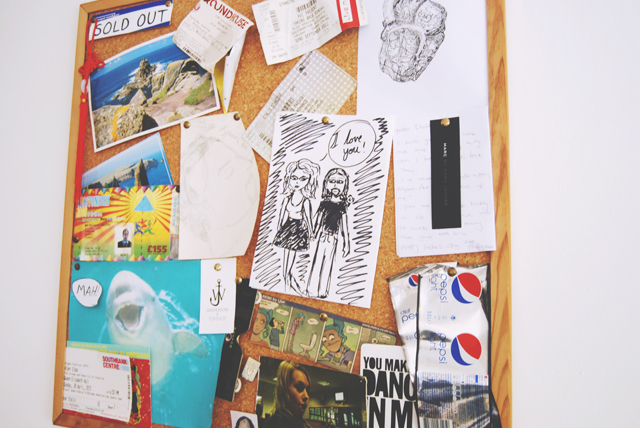 As you can see it has gig tickets, doodles, postcards, Diet Pepsi labels from different countries... Anything that we like, or that has sentimental value, goes up on here. This is where the Mad Men theme falls down! I keep my shoes here, since the front door opens into this room, all lined up on an Ikea Billy bookcase. Sooty and Sweep are supposed to live in my car but we brought them in when it was snowing (I felt sorry for them out in the cold!). When I start driving, I'll move them back into their home. 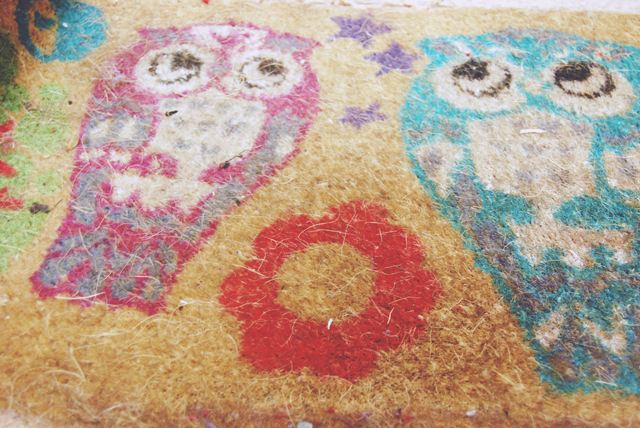 I love the owl doormat. Unfortunately, our door opens inwards and the bottom is right at floor level, so the doormat has to sit about 2 feet away from the door and I have to hop onto it when I get home. This room has been used as a kind of storage for our various collections. 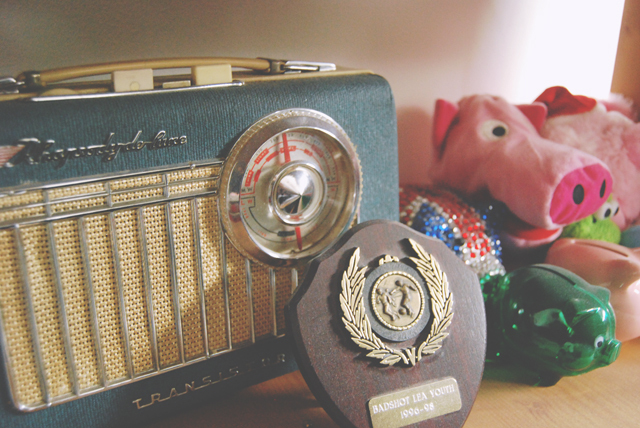 Here you can see my vintage 60s radio (it doesn't work), some of my piggies and Rich's football trophy from 1996. I've definitely made this room look a lot nicer than it actually is. It's really a state with coats, shoes and computer equipment on every surface haha! Haha it's a total mess! That's why I only show little bits of it haha! I need another bookcase now though. I've run out of room! This is a great post, I love your clocks! I can't believe the first one is from Wilkson's! Parts of it are. Most of it is just standard rental home in appearance haha! I really love clocks haha! Looks like a cool house. Love sooty and sweep and the clocks really adds character. 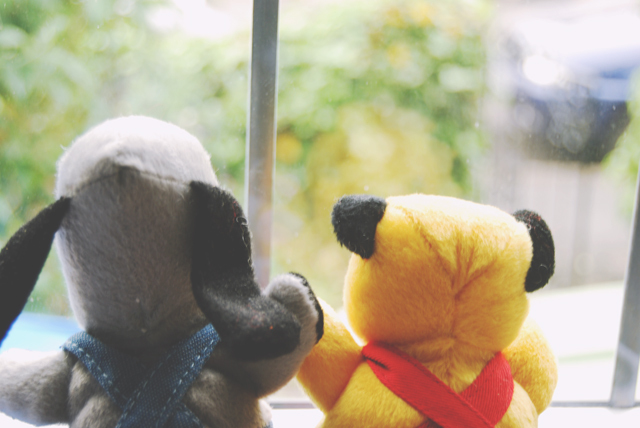 Sooty and Sweep are the best bit! I adore all your little collections! So much inspo for my own house.